CHICAGO—In the movie “Shaft,” the lead character is a baaad … well, you know the rest. But the actor who played the iconic character told an audience here that even John Shaft would have a difficult time navigating the hurdles of prejudice and racism that exist in Hollywood. 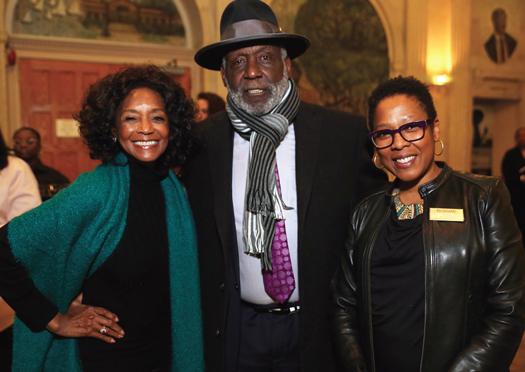 Richard Roundtree joined a host of other Black Hollywood actors, writers and producers March 11 in a conversation about “Race and the Media: Series 1” at the DuSable Museum on the city’s South Side. The event was the first in a series of gatherings the museum will host to discuss the current state of the performing arts and controversies of race and inclusion. Mr. Roundtree said the difficulty for Blacks in Hollywood today is the White toll booth at the production door. “Unless you are able to get your project produced and mounted it don’t mean a damn thing,” he said emphatically. That sentiment was echoed from others on the panel that included actresses Dawnn Lewis and Margaret Avery, musician Najee, filmmaker D. Channsin Berry and screenwriter Rodney Barnes. The crowd of 200 leaned in on every word of what has become a common refrain in discussions about the racism that exists in the institutions throughout the country. “White writers and producers write what they think we would say. They get it wrong most of the time. And they inflict in casting their prejudices,” she said, explaining that once she wasn’t cast as a lawyer because the producers didn’t think Whites in the South would believe a Black woman could be a lawyer. “We don’t make judgements about the Holocaust so how do they make judgements about us,” she asked. Mr. Barnes, a co-producer of the “Boondocks,” described Hollywood as a high-school cafeteria where if you don’t fit in at the table you’re excluded. He said he pitches different ideas to mostly White producers who try to change the concept into something they can relate to. If the process goes on long enough, “I don’t recognize the idea anymore,” he said. “It’s difficult to be culturally specific as long as it’s filtered through White thought. Even though you’re seeing more Black faces, they don’t sound like Black people,” he said. Ms. Lewis, known for her character Jaleesa on “A Different World,” was the most vocal on the panel, declaring that change will come in Hollywood when Blacks start withholding their financial support from programs that don’t properly reflect Black people. She said projects get the green lit based on whether they will make money, adding that if she were White with the same talents she has today, she would have been offered a wider variety of character roles. Black actors get called in for specific roles and age groups, and Hollywood too often goes to the same Black actors as if others didn’t exist, she said. Channsin Berry took the entrepreneurial route to producing his documentaries. After studying the pioneering Black filmmaker Oscar Micheaux and Tyler Perry’s independent model, Mr. Berry said he took his documentary “Dark Girls” to venues on the road like a concert. He used social media, marketing and networking to make the screenings an event and a movement. After getting 6 million hits on social media, the film made $125,000 the first weekend out, he said. “I went out and talked to my people on social media and you guys started tweeting. The next thing I know I’m in Newark, in London, in Paris. I’m in Africa because of social media and what you have done. It was between us and our relationship,” he said. Musician Najee has scored music for several films. He said Hollywood needs to “include more of the Diaspora of the human experience” and be more truthful. He expressed the irony of the movie “Gods of Egypt” featuring White lead actors. Mr. Berry also called on the community to stop bootleggers and downloading content for free because such actions deprive artists of making a living and being able to produce new content. Young actor Jason Jack Edwards, who appeared in commercials and the film “Black Dynamite,” attended the event to hear how to survive in the industry.